I used to be a complete potato fiend and would eat them with almost every meal while I was growing up. These days, my tastes have broadened to sweet potatoes, yams and other root vegetables, but good old potatoes are still my first love and there’s something deliciously cosy about eating them. This recipe is quite the guilty pleasure: it’s pretty indulgent and not one I’d recommend you eat everyday. Still, when trawling through Pinterest, I saw an image of Duchess Potatoes and they looked so pretty I couldn’t resist trying to make a vegan version. 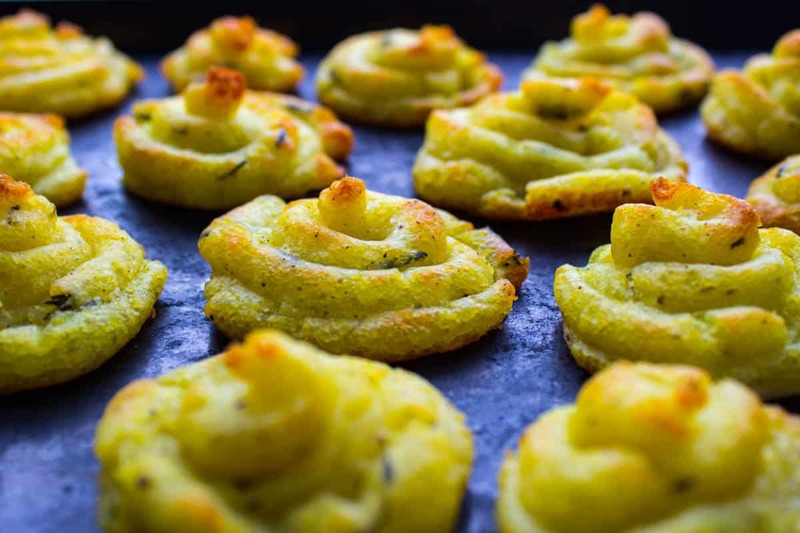 They are traditionally made with butter, cream and eggs, so I’ve used a mix of turmeric powder and avocado oil here to give these Herby Duchess Potatoes their rich taste and golden colour. Duchess Potatoes are best served as a side to an accompanying protein dish – nut loaves, sausages and lentil burgers are all delicious with these. 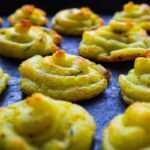 This Herby Duchess Potatoes recipe is basically simple, but using an icing bag can take some getting used to so allow yourself plenty of time to practise. You may find that your first few potato cakes look pretty unappealing – as you can see, in the photos above and below I still hadn’t quite mastered it, and had the wrong nozzle, so it does take practise! If you don’t fancy doing that, you can always make one giant potato cake and spread it across a baking sheet, fluffing the top with a fork to make it crispy. Need some comfort food that tastes amazing? 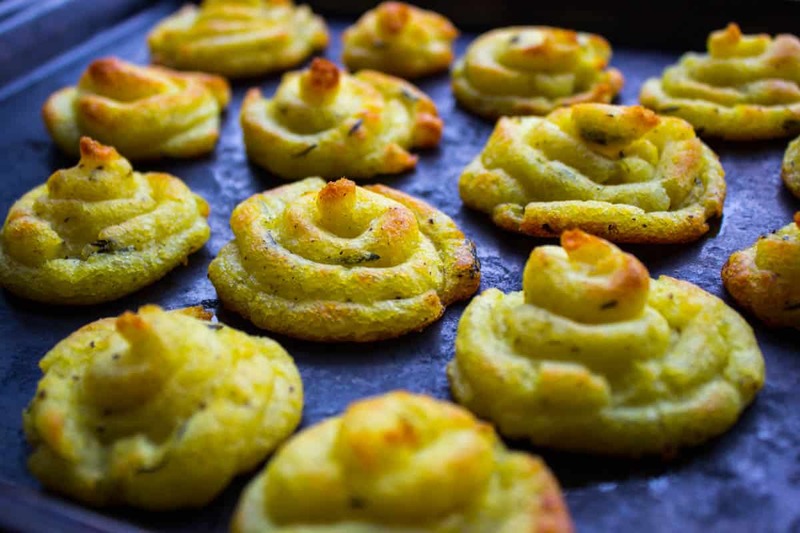 Try this no-butter, vegan take on deliciously satisfying Herby Duchess Potatoes (gluten-free). Boil potatoes in a saucepan for 10-15 minutes, until tender. When cooked, remove from heat and drain. Return to saucepan. Add the oil, turmeric, thyme, salt and pepper, and mash the potatoes using a masher or ricer. Mash until they’re really smooth! You don’t want to find lumpy bits after you bite into them. Spoon the mash into an icing bag with a large nozzle (or use a clean freezer bag with a 1cm hole cut in the bottom corner). Swirl the nozzle of the bag into small circular mounds (about 4-5cm wide) on a clean baking sheet. Bake in the oven for 20-25 minutes, until the top of each potato cake is turning golden. Remove from the oven and pat off excess oil. Serve immediately!